Beethoven’s works for the combination of cello and piano span much of his compositional career, and each of his three recognized stylistic periods is represented by a Sonata, or pair of Sonatas. With these historic works it is fair to say Beethoven created a new instrumental form. Earlier works do exist for a duo of cello and keyboard instrument, such as the sonatas written by Anton Kraft (1749-1820) in the years immediately preceding Beethoven’s Op 5, but the accompaniment is of the Baroque continuo type rather than Beethoven’s concept of the two instruments as equal partners – or at least as equal as the instruments of his time would allow. At the time the Op 5 and Op 69 Sonatas were written the piano still had a fairly lightweight tone and limited sustaining power. Beethoven thus had to forego the exploitation of the cello’s capacity for cantabile playing and the writing of true slow movements (he allows himself slow introductions to some of the movements) until the very last Sonata, for fear of overpowering the piano. At the court of King Frederic Wilhelm II he played the two grand sonatas with obbligato violoncello, Op 5, written for [Jean-Pierre] Duport, the King’s first violoncellist, and himself. On his departure he received a gold snuff-box filled with louis d’ors. Beethoven declared with pride that it was not an ordinary snuff-box, but one that it might have been customary to give to an ambassador. The King, like his uncle Frederick the Great, was a cultivated musician, a cellist for whom Mozart had composed his ‘Prussian’ String Quartets only six years earlier. His influence on the musical life of Berlin was powerful, encouraging the performance of operas by Gluck and Mozart, among other pioneering work, and it seems possible that he offered Beethoven the vacant position of Kapellmeister on the basis of the Cello Sonatas dedicated to him. But the King died the following year, before he could persuade Beethoven, who had anyway since returned to Vienna. Beethoven performed the Sonatas for the first time in Vienna early in 1797 at a concert given with the cellist Bernhard Romberg, a former colleague from the Bonn court orchestra who was passing through the Austrian capital on his way north from Italy. By this time, Beethoven had prepared the sonatas for publication; they were advertised by the firm of Artaria in the Wiener Zeitung in February 1797. The F major Sonata, Op 5 No 1, has only two movements, though both are quite substantial, the first introduced by an Adagio sostenuto that is almost a movement in its own right. It gradually unfolds from arpeggios on the common chord of F major, an idea that is also present in the first subject of the main Allegro, a dolce melody on the piano that is soon repeated on the cello. An extensive bridge passage, dominated by off-beat accents, leads to the fragmentary second subject group in the dominant: semiquaver scales run into a staccato passage on the piano alone before the cello enters with a more melodic idea and the codetta makes way for the wide-ranging development section. The recapitulation is a straightforward restatement of the opening section, but the coda is extended by the interpolation of a short Adagio passage (unrelated to the introduction) and a similarly brief Presto section of dominant preparation to the concluding affirmation of F major. The second and final movement is a rondo in 6/8 time with a main theme that makes much play out of a rhythmic displacement between the two instruments. Beethoven had been told that his new friend could execute violoncello music upon his huge instrument, and one morning, when Dragonetti called at his room, he expressed his desire to hear a sonata. The contrabass was sent for, and the Sonata, No 2 of Op 5, was selected. Beethoven played his part, with his eyes immovably fixed upon his companion, and, in the finale, where the arpeggios occur, was so delighted and excited that at the close he sprang up and threw his arms around both player and instrument. Like the First Sonata the G minor work has a slow introduction, which here is even more expansive, amounting to an expressive and often dramatic fantasia. The first Allegro is an example of Beethoven’s predilection for including a wide range of diverse material within one movement. The restrained opening theme is soon interrupted by a forte idea accompanied by pounding quaver triplets which are only brought to a halt with the lead-in to the more song-like second subject. The finale is again a rondo, this time in 2/4 time and in G major, with a variety of lively rhythmic patterning and much rapid figuration in demi-semiquavers, culminating in a hectic coda. The single Sonata of Op 69 was sketched in 1807, some ten years after the Op 5 pair and concurrently with the Fifth Symphony (Op 67). It was completed in the spring of 1808 in Heiligenstadt and contracted to the publishers Breitkopf & Härtel in September, who issued it the following April in an edition full of printer’s errors. The dedication of the Sonata was to Count Ignaz von Gleichenstein, a Secretary at the War Department and a trusted friend of the composer. It had been performed for the first time a month earlier, in March 1809, by the cellist Nikolaus Kraft (the son of Anton Kraft and a member of Schuppanzigh’s famous string quartet) and Baroness Dorothea von Ertmann, one of the greatest of the first generation of Beethoven pianists. The lyrical A major world of this third Sonata conveys as well as any other work of the period the self-confident mood that Beethoven was in during the latter half of the first decade of the nineteenth century, before his life was disrupted by the French invasion of Vienna in the middle of 1809. The first movement opens rather like the slightly earlier Fourth Piano Concerto (1806) with, in this case, the cello entering softly and unaccompanied with a theme that gradually builds to a short piano flourish, repeated with the roles reversed. A vigorous bridge passage leads to the second subject, a combination of rising scales and downward arpeggios, again repeated with the instrumental roles inverted. The triplets of the bridge return with the codetta to the exposition which is dominated by an attractive idea new to the movement. The development concentrates on the music of the first subject which in a foreshortened form eventually opens the recapitulation, before reappearing at the end of the movement. There follows the only Scherzo of these Sonatas and it is typical of the form as Beethoven developed it during his ‘middle period’ works, with its length approaching that of the outer movements, achieved by repeating the almost waltz-like ‘trio’ between three statements of the syncopated main scherzo theme. The slow introduction to the finale is shorter than those to the first movements of the two earlier sonatas, with more of a cantabile continuity to it. The Allegro vivace recalls the opening of the first ‘Rasumovsky’ String Quartet in both the configuration of its opening theme and in its sunny mood which continues into the restrained second subject where cello and piano alternate short phrases. Let the violoncello apply himself, starting on the left bank of the Danube he is to play until everyone has crossed from the right bank of the Danube. What’s more, I am confident of the route over the Danube I have already set; with courage one may gain any objective if righteous. The C major Sonata, despite the development by this stage of a piano closer to the more sonorous instrument of today, again eschews a full slow movement, but Beethoven this time preludes each of the two movements with a slow introduction. Of these the Andante is the more substantial, opening, rather in the manner of Op 69, with the cello alone, followed by a complementary phrase on the piano, both extended gently and rhapsodically until interrupted by the fortissimo arrival of the first Allegro vivace, which is actually in A minor. The argument is far more concentrated than in the earlier sonatas – Beethoven had by now moved away from the expansiveness of his middle period. The second movement opens with a short improvisatory Adagio which, before making way for the main part of the movement, allows a brief recall of the first movement’s Andante material. The finale proper is a terse sonata-form movement dominated by the short rising figure of the first few bars (perhaps derived from the theme of the Andante) and rapid semiquaver movement. But twice this movement is interrupted by pauses and still, open fifths on cello. At the end the tension winds down before the tempo is picked up again for the last couple of bars. The first movement of the D major Sonata shows evidence of the new possibilities available in the cello writing with a singing, dolce first subject. Despite the Adagio being the first real slow movement of these Sonatas, the main melody is a rather restrained affair, with short rests at the end of each two-bar phrase – the smoother melodic writing is reserved for the middle section of the ABA structure. The finale follows without a break, though not before tentative attempts at the main subject forestall the arrival of the movement proper – a fully-fledged fugue. In fact this is the first occasion where Beethoven uses a fugue as the basis of a movement (instead of merely incorporating fugal writing into another form), and is thus also the first example of the contrapuntal thinking that was to dominate his final years. The twelve Handel variations, reflecting the manner of the stately theme, find Beethoven in a particularly formal mood. The foursquare nature of the theme (Allegretto) is maintained right up to the tenth variation which comes full circle with an Allegro statement of the original melody. The final two variations are a rhapsodic Adagio, where the theme is disguised further than anywhere else in the work, and a jovial 3/8, Allegro finale. With the Op 66 Mozart variations Beethoven’s treatment is notably more relaxed with, in particular, a greater flexibility in the use of the instruments. The staccato presentation of the Allegretto theme reminds the listener that in its original context Mozart composed it for the strumento di acciaio (‘instrument of steel’, probably a glockenspiel). The cello is silent in the first variation but plays a full contrapuntal part in the second. In the third it is almost static, leaving the fast figuration to the piano. The next six variations explore a wide variety of textures and modes of treatment of the theme. As in the Handel variations the tenth variation is an Adagio, while the penultimate is here an expressive movement marked Poco adagio, quasi Andante, leading straight into the triple-time, Allegro, final variation. The second set of Mozart variations, WoO46, was written roughly half way between the Op 5 and Op 69 Sonatas, in 1801. At the beginning of that year Schikaneder’s production of Die Zauberflöte at the new Theater an der Wien (later to see the première of Beethoven’s Fidelio) made the opera ‘the subject of common gossip’ and most likely inspired Beethoven’s seven variations on the duet ‘Bei Männern, welche Liebe fühlen’. The phrases of the Andante theme are shared between the two instruments, a practice which continues through the first four variations, where the tempo of the theme is maintained but the note-lengths are shortened. The tempo quickens for the playful fifth variation, but slows to an Adagio for the rhapsodic sixth. The final variation, Allegro, ma non troppo, is followed by an extensive coda which introduces a new theme in C minor, and after a continual tendency towards a pianissimo, the fortissimo end comes almost as a surprise. Les œuvres pour violoncelle et piano couvrirent une grande partie de la carrière de compositeur de Beethoven. Chacune de ces trois grandes périodes stylistiques reconnues est ainsi illustrée par des sonates, seules ou par deux, œuvres historiques qui nous permettent de dire que Beethoven créa une nouvelle forme instrumentale. Certes, certaines œuvres avaient déjà été composées pour duo de violoncelle et clavier, telles les sonates écrites par Anton Kraft (1752-1820) dans les années immédiatement antérieures à l’opus 5 de Beethoven, mais leur accompagnement demeure de type continuo baroque, sans atteindre au concept beethovenien de deux instruments traités comme des partenaires sinon parfaitement égaux, du moins aussi équivalents que les instruments de l’epoque le permettaient. Au moment où les sonates Opp 5 et 69 furent composées, le piano possédait un ton assez léger et une puissance de prolongation limitée. D’où l’obligation pour Beethoven de renoncer, par crainte d’accabler le piano, à l’exploitation de la capacité du violoncelle pour le cantabile, mais aussi à l’écriture de véritables mouvements lents jusqu’à la toute dernière sonate (il s’autorise cependant des introductions lentes pour certains mouvements). La sonate en fa majeur Op 5 nº1 ne comporte que deux mouvements, mais substantiels – le premier étant introduit par un Adagio sostenuto qui est presque en lui-même un mouvement. La pièce se déploie graduellement à partir d’arpèges sur l’accord parfait en fa majeur, une idée déjà présente dans le premier thème de l’Allegro principal, mélodie dolce au piano, bientôt reprise au violoncelle. Un vaste pont, dominé par des accents sur les temps faibles, conduit au groupe fragmentaire du second thème, dans la dominante: des gammes de doubles croches courent sur le piano seul, dans un passage staccato, avant que le violoncelle entre avec une idée plus mélodique et que la codetta cède la place à une ample section de développement. La reprise est une pure répétition de la section initiale, à ceci près que la coda est prolongée par l’interpolation d’un court passage Adagio (sans rapport avec l’introduction) et d’une section Presto identiquement brève de la préparation de la dominante à l’affirmation conclusive en fa majeur. Le second et dernier mouvement est un rondo dans une mesure à six-huit, avec un thème principal qui joue beaucoup d’un déplacement rythmique entre les deux instruments. Beethoven avait appris que son nouvel ami pouvait exécuter de la musique pour violoncelle sur son énorme instrument. La contrebasse fut envoyée chercher, et la sonate no2 de l’opus 5 choisie. Beethoven joua sa partie, les yeux immuablement fixés sur son compagnon, jusqu’au finale et à l’apparition des arpèges. Là, il fut si enchanté et excité qu’il se leva d’un bond et lança ses bras autour du joueur et de l’instrument. L’unique sonate de l’opus 69 fut esquissée en 1807, quelque dix ans après les deux sonates de l’opus 5 et en même temps que la Cinquième symphonie (opus 67). Achevée au printemps de l’année 1808 à Heiligenstadt, elle fut donnée en septembre, et par contrat, aux éditeurs Breitkopf & Härtel qui la publièrent au mois d’avril suivant, dans une version truffée d’erreurs d’impression. L’œuvre, dédiée au comte Ignaz von Gleichenstein, Secrétaire d’État au Ministère de le guerre et ami de confiance du compositeur, avait été créée un mois plus tôt, en mars 1809, par le violoncelliste Nikolaus Kraft (fils d’Anton Kraft et membre du célèbre quatuor à cordes Schuppanzigh) et par la baronne Dorothea von Ertmann, une des représentantes majeures de la première génération de pianistes beethoveniens. Plus que toute autre œuvre de cette période, le monde lyrique en la majeur de la troisième sonate véhicule l’humeur pleine d’assurance qui était celle de Beethoven dans la seconde moitié de la première décennie du XIXe siècle, avant que sa vie fût brisée par l’invasion française de Vienne, au milieu de l’année 1809. Le premier mouvement s’ouvre plutôt comme le Quatrième concerto pour piano, légèrement antérieur (1806), avec le violoncelle qui entre doucement, seul, et un thème qui se construit progressivement jusqu’à une courte fioriture pour piano, reprise avec les rôles inversés. Un vigoureux pont introduit le second thème – une combinaison de gammes ascendantes et d’arpèges descendants –, également répéte avec les rôles instrumentaux inversés. Avec la codetta les triolets du pont reviennent à l’exposition, dominée par une idée attrayante, nouvelle pour le mouvement. Le développement se concentre sur la musisue du premier thème qui entame la reprise, dans une forme réduite, avant de réapparaître à la fin du mouvement. Vient ensuite l’unique scherzo de ces sonates, typique de la forme que Beethoven développa dans les œuvres de sa ‘période moyenne’ – sa longueur approche celle des mouvements extrêmes, et elle répète le ‘trio’ presque valsé entre trois expositions du thème principal du scherzo, syncopé. La lente introduction du finale est plus brève que celle des premiers mouvements des deux sonates antérieures, avec une continuité plus cantabile. L’Allegro vivace rappelle l’ouverture du premier quatuor à cordes ‘Rasumovski’, que ce soit dans la configuration de son thème initial ou dans son humeur ensoleillée, qui se poursuit dans le second thème, contenu, où violoncelle et piano alternent de courtes phrases. Les deux sonates de l’opus 102, peut-être les premières œuvres de la période ‘tardive’ de Beethoven, furent composées en 1815 et respectivement achevées ‘vers fin juillet’ et ‘début août’, selon les termes du manuscrit. L’inspiration sous-jacente provint du violoncelliste Josef Linke. Cet autre musicien dévoué de Beethoven était membre du quatuor à cordes du prince Rasumovski, ancien ambassadeur de Russie à Vienne, lorsque le palais de ce dernier fut réduit en cendres, à la fin du mois de décembre 1814, alors qu’il était préparé pour un énorme banquet royal. Le quatuor dut être dissout et Linke fut engagé par les Erdödy, la comtesse Anne-Marie (à laquelle les sonates opus 102 sont dédiées) et le comte Peter, qu’il accompagna pour l’été dans leur retraite de Jedlersee am Marchfelde, à l’est de Vienne. Beethoven, ami affectionné du couple, saisissait toute occasion de s’échapper de la ville pour leur rendre visite, à eux et à son violoncelliste favori. Malgré le développement d’un piano plus proche de l’instrument actuel, plus sonore, la sonate en ut majeur évite à nouveau un mouvement lent complet. 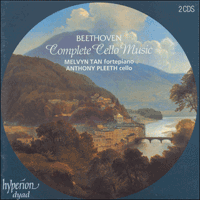 Mais cette fois, Beethoven place une lente introduction avant chacun des deux mouvements. L’Andante, le plus substantiel des deux, s’ouvre, plutôt à la manière de l’opus 69, sur le violoncelle seul, suivi d’une phrase complémentaire au piano. Les deux instruments se prolongent ensuite, doucement et rhapsodiquement, jusqu’à être interrompus par l’arrivée fortissimo du premier Allegro vivace, qui est en réalité en la mineur. L’opposition est beaucoup plus concentrée que dans les sonates antérieures, car Beethoven s’était départi de l’expansivité de sa période moyenne. Le second mouvement commence par un bref Adagio de caractère improvisé, qui autorise une éphémère reprise du matériau Andante du premier mouvement, avant de faire place à la partie principale. Le finale proprement dit est un laconique mouvement de forme sonate, dominé par la courte figure ascendante des premières mesures (peut-être dérivées du thème de l’Andante) et par un rapide mouvement de doubles croches. Mais des points d’orgue et de tranquilles quintes à vide au violoncelle viennent à deux reprises rompre ce mouvement. Pour finir, la tension se relâche avant que le tempo soit repris pour les deux dernières mesures. Le premier mouvement de la sonate en ré majeur illustre les nouvelles possibilités de l’écriture violoncellistique, avec un premier thème chantant, dolce. Bien que l’Adagio soit le véritable premier mouvement de ces sonates, la mélodie principale est plutôt contenue, avec de courtes pauses à la fin de chaque phrase de deux mesures – une écriture mélodique plus fluide étant réservée à la section centrale de la structure ABA. Le finale suit immédiatement, sans qu’une seule tentative préliminaire du thème principal vienne anticiper l’arrivée du mouvement en tant que tel – une fugue à part entière. Pour la première fois, Beethoven prend pour base du mouvement une fugue (au lieu de simplement incorporer une écriture fuguée dans une autre forme). Pour la première fois aussi, il nous offre un exemple de la pensée contrapuntique qui allait dominer ses dernières années. Les douze variations sur Haendel, qui reflètent la manière du thème majestueux, trouvent Beethoven dans une humeur particulièrement solennelle. La nature inébranlable du thème (Allegretto) est fermement maintenue jusqu’à la dixième variation, qui constitue un cycle complet avec une exposition Allegro de la mélodie originale. Les deux variations finales sont un Adagio rhapsodique, avec le thème plus que jamais déguisé, et un finale Allegro, jovial, dans une mesure à trois-huit. Les variations sur Mozart, opus 66, présentent un traitement beethovenien remarquablement plus détendu avec, notamment, une plus grande flexibilité dans l’usage des instruments. La présentation staccato du thème Allegretto rappelle à l’auditeur que Mozart le composa originellement pour le strumento di acciaio (‘instrument d’acier’, probablement un glockenspiel). Le violoncelle, silencieux dans la première variation, joue toute une partie contrapuntique dans la deuxième avant d’être presque statique dans la troisième, où il cède au piano les figurations rapides. Les six variations suivantes explorent une grande diversité de textures et de modes de traitement du thème. A l’instar des variations sur Haendel, la dixième variation est un Adagio. Quant à la pénultième, mouvement expressif marqué Poco adagio, quasi andante, elle conduit droit à l’ultime variation, ternaire et Allegro. Le second corpus de variations sur Mozart, WoO46, fut composé en 1801, grosso modo entre les sonates Opp 5 et 69. Au début de cette année-là, le Die Zauberflöte produit par Schikaneder au nouveau Theater-an-der-Wien (qui devait par la suite voir la première de l’opéra de Beethoven, Fidelio), fit de l’opéra ‘le sujet de commérages’ et inspira très probablement à Beethoven ses seize variations sur le duo ‘Bei Männern, welche Liebe fühlen’. Les phrases du thème Andante sont partagées entre les deux instruments, pratique qui se perpétue dans les quatre premières variations, où le tempo du thème est maintenu tandis que la longueur des notes est raccourcie. Le tempo s’accélère à la cinquième variation, enjouée, mais ralentit à la sixième, rhapsodique, jusqu’à devenir un Adagio. La variation finale Allegro, ma, non troppo est suivie d’une ample coda qui introduit un nouveau thème en ut mineur. Et la fin fortissimo, qui conclut une œuvre presque continuellement tendue vers le pianissimo, apparaît quasiment comme une surprise. Beethovens Werke für Cello und Klavier ziehen sich durch seine gesamte kompositorische Laufbahn, und jede seiner drei anerkannten Stilperioden wird in einer Sonate – oder einem Sonatenpaar repräsentiert. So kann hier die Behauptung gewagt werden, daß Beethoven mit diesen inzwischen historischen Werken eine neue Instrumentalform geschaffen hatte. Zwar existieren frühere Werk für Celloduo und Tasteninstrument wie die Sonaten, die Anton Kraft (1752-1820) in den Jahren unmittelbar nach der Entstehung von Beethovens Op 5 komponierte. Sie werden im Gegensatz zu Beethovens Grundvorstellung zweier Instrumente als gleichwertige Partner – oder zumindest von jener Gleichberechtigung, die die damalige Mode den Instrumenten einräumte, allerdings vom eher barocken Continuo begleitet. Zu jener Zeit, als die Sonaten aus den Opp 5 und 69 entstanden, besaß das Klavier nicht die Klangschwere und haltende Stärke, die wir heute mit dem Instrument verbinden. Beethoven mußte auf die Möglichkeit des Cantabile-Spiels des Cellos verzichten, und das Schreiben von wirklich langsamen Sätzen (er erlaubte sich zu einigen Sätzen einige langsame Einleitungen) bis zur allerletzten Sonate aufheben, aus Furcht, das Klavier zu überstimmen. Die Sonate in F-Dur, Op 5, Nr. 1, besteht aus nur zwei Sätzen, die allerdings beide recht umfassend sind. Der erste wird von einem Adagio sostenuto eingeleitet, das in sich selbst beinahe ein Satz ist. In seinen Arpeggios offenbart es nach und nach den Dreiklang in F-Dur, eine Idee, die auch im ersten Thema des Allegro vorhanden ist, einer dolce Melodie auf dem Klavier, die schon bald vom Cello wiederholt wird. Eine umfangreiche, akzentuierte Übergangspassage, die von Auftakten dominiert wird, führt dann zur fragmentarischen zweiten Themengruppe auf der Dominante: Skalen von Sechzehntelnoten laufen in eine allein auf dem Klavier gespielte Staccatopassage über, ehe das Cello mit einer mehr melodischen Idee einsetzt, und die Codetta einer umfassenden Durchführung weicht. Die Reprise ist eine unkomplizierte Bestätigung des einleitenden Abschnittes, jedoch ist die Coda durch das Einflechten einer kurzen Adagiopassage (ohne Verbindung zur Einleitung) erweitert, und ein ähnlich kurzer Prestoabschnitt auf der Dominante bereitet die abschließende Bestätigung der Tonart F-Dur vor. Der zweite und letzte Satz ist ein Rondo im Sechsachteltakt, dessen Hauptmelodie viel Aufhebens von den rhythmischen Verschiebungen zwischen den beiden Instrumenten macht. Man hatte Beethoven erzählt, sein neuer Freund könne auf seinem großen Instrument Musik für das Violoncello spielen, und eines Morgens, als Dragonetti ihn in seinem Zimmer besuchte, äußerte er den Wunsch, eine Sonate zu hören. Es wurde nach dem Kontrabaß geschickt und die Sonate Nr. 2 des Op 5 gewählt. Während er seinen Teil der Musik spielte, wendete Beethoven nicht einen Moment die Augen von seinem musikalischen Kompagnon ab und war von den Arpeggios des Finales so begeistert und erregt, daß er zum Schluß aufsprang und seine Arme um sowohl Musiker als auch Instrument warf. Wie die erste Sonate wird das Werk in g-Moll langsam eingeführt und hier sogar noch expansiver gestaltet, indem schließlich eine ausdrucksvolle und zuweilen dramatische Fantasie entwickelt wird. Das erste Allegro ist ein Beispiel von Beethovens Vorliebe, in einen Satz eine große Palette von unterschiedlichem Material einzubauen. Das verhaltene Thema der Eröffnung wird schon bald von einer mit forte bezeichneten Idee unterbrochen und von dröhnenden Achtelnoten-Triolen begleitet, denen erst beim Übergang zum zweiten, liederähnlichen Thema Einhalt geboten wird. Wiederum erscheint das Finale in Gestalt eines Rondos, dieses Mal im Zweivierteltakt und G-Dur, mit einer Vielfalt an lebhaft rhythmischen Strukturen und manch schneller Figuration in Zweiunddreißigstelnoten, bis es schließlich in einer hektischen Coda seinen Höhepunkt erreicht. Die erste Skizze der einzigen Sonate des Op 69 war 1807, ungefähr zehn Jahre nach dem Sonatenpaar des Op 5 und parallel zur Komposition der fünften Sinfonie (Op 67), entstanden. Sie war im Frühling 1808 in Heiligenstadt vollendet und im September an die Verleger Breitkopf und Härtel übergeben worden, die im darauffolgenden April eine Ausgabe von ihr veröffentlichten, die mit Druckfehlern nur so gespickt war. Die Sonate war dem Grafen Ignaz von Gleichenstein, einem Sekretär im Kriegsministerium und ergebenen Freund des Komponisten, gewidmet. Ihre Uraufführung hatte sie bereits einen Monat zuvor, im März 1809, mit dem Cellisten Nikolaus Kraft (dem Sohn Anton Krafts und Mitglied von Schuppanzighs berühmtem Streichquartett) und der Baronin Dorothea von Ertmann, einer der begabtesten Vertreterinnen der ersten Generation von Beethoven-Pianisten, erlebt. Wie sämtliche der Werke dieser Periode offenbart auch die dritte Sonate mit ihrem lyrischen Hauch in A-Dur jene selbstbewußte Stimmung, in der Beethoven sich in der letzten Hälfte des ersten Jahrzehnts des neunzehnten Jahrhunderts befand, ehe sein Wiener Dasein in der Mitte des Jahres 1809 durch die Invasion der französischen Truppen gestört wurde. Dem etwas früher komponierten vierten Klavierkonzert nicht unähnlich (1806) eröffnet das Cello den ersten Satz mit einer sanften und unbegleiteten Melodie, die nach und nach in ein kurzes Aufblühen des Klaviers hineinleitet, wonach die Rollen getauscht werden. Eine kraftvolle Übergangspassage führt zum zweiten Thema, einer Verbindung aufsteigender Skalen und abfallender Arpeggios, die nach einem Rollentausch erneut wiederholt wird. In der Exposition, die von einer ansprechenden, für den Satz vollkommen neuen Idee dominiert ist, kehren mit der Codetta die Triolen der Übergangspassage zurück. Die Durchführung konzentriert sich auf die Musik des ersten Themas, das verkürzt schließlich den Repriseneintritt einleitet, ehe es am Ende des Satzes nochmals erscheint. Es folgt das einzige Scherzo dieser Sonaten, das in seiner Form ein recht bezeichnendes Beispiel der Beethovenschen ‘mittleren Schaffensperiode’ ausmacht. Seine Länge, die durch die Wiederholung des beinahe walzerähnlichen ‘Trios’ zwischen den drei Vorstellungen des synkopierten Hauptthemas des Scherzos erreicht wird, entspricht beinahe jener der äußeren Sätze. Die langsame Einleitung des Finales ist im Vergleich zu jener des jeweils ersten Satzes der früheren Sonaten kürzer und strahlt nun vielmehr eine Kontinuität im Sinne von cantabile aus. Das Allegro vivace erinnert sowohl in seiner Konfiguration des einleitenden Themas als auch mit seiner strahlenden Stimmung, die bis in das verhaltene zweite Thema fortgesetzt wird, in dem Cello und Klavier abwechselnd kurze Phrasen spielen, an die Einführung des ersten ‘Rasumowsky’-Streichquartetts. Die beiden Sonaten des Op 102, vielleicht die ersten Werke aus Beethovens sogenannter ‘späten Schaffensperiode’, wurden 1815 komponiert. Die erste wurde dem Wortlaut des Manuskripts nach ‘Ende Juni’, die zweite ‘Anfang August’ vollendet. Inspiration hatte der Komponist bei einem weiteren Musiker und treuen Freund, dem Cellisten Josef Linke, gefunden. Linke war Mitglied des Streichquartetts aus dem Hause des Prinzen Rasumowsky, eines ehemaligen russischen Botschafters in Wien, bis jedoch gegen Ende Dezember 1814 der Palast des Prinzen, der oft den Rahmen für enorme königliche Bankette gebildet hatte, bis auf seine Grundmauern niederbrannte. Das Quartett wurde aufgelöst, und Linke erhielt nun eine Stellung bei den Erdödys, der Gräfin Anne Marie (der die Sonaten des Op 102 gewidmet sind) und dem Grafen Peter, mit denen er den Sommer in deren Sommerresidenz am Jedlersee in Marchfelde, östlich von Wien, verbrachte. Beethoven, ein inniger Freund des Grafenpaares, nutzte jede Gelegenheit, um der Stadt zu entfliehen und diese beiden und seinen Lieblingscellisten zu besuchen. In der Sonate in C-Dur umgeht der Komponist trotz der Durchführung auf dem für damalige Verhältnisse bereits recht sonoren Klavier abermals einen vollständigen langsamen Satz, beginnt allerdings jeden der beiden Sätze mit einem langsamen Präludium. Von diesen ist das Andante am umfangreichsten, mit einer Eröffnung, die jener des Op 69 in nichts nachsteht, und in der das Cello erst allein erklingt, dann von einer ansprechenden Phrase auf dem Klavier begleitet wird. Das Spiel beider Instrumente wird sanft und rhapsodisch erweitert, bis es schließlich vom mit fortissimo bezeichneten Einsatz des ersten Allegro vivace unterbrochen wird, das praktisch in a-Moll gehalten ist. Die Aussage ist im Vergleich zu den frühen Sonaten wesentlich konzentrierter – Beethoven hatte sich nun von der Mitteilsamkeit seiner mittleren Schaffensperiode entfernt. Der zweite Satz beginnt mit einem kurzen, improvisatorischen Adagio, das, ehe es dem Hauptteil des Satzes weicht, kurz das Andantematerial des ersten Satzes in Erinnerung ruft. Der eigentliche abschließende Satz erscheint in einer knappen Sonatenform und ist von einer in den ersten Takten erklingenden kurz aufsteigenden Figur (die vielleicht von der Andantemelodie abgeleitet ist) und schnellen Sechzehntelnoten dominiert. Zweimal wird dieser Satz jedoch von Pausen und ruhigen, offenen Quinten des Cellos unterbrochen. Die Spannung löst sich schließlich, ehe das Tempo in den letzten Takten wieder aufgenommen wird. Der erste Satz der Sonate in D-Dur deutet jene neuen Möglichkeiten an, die die Komposition für Cello durch ein singendes erstes dolce Thema bereicherten. Obwohl in diesen Sonaten das Adagio praktisch den ersten richtigen langsamen Satz darstellt, verbleibt die Hauptmelodie noch verhalten, mit kurzen Pausen am Ende jeder zweitaktigen Phrase – die glattere und sanftere melodische Komposition wird dem mittleren Abschnitt der ABA-Struktur vorbehalten. Das Finale setzt unmittelbar ein, jedoch nicht, bevor zögernde Versuche des Hauptthemas der Ankündigung des eigentlichen Satzes zuvorkommen – mit einer ausgewachsenen Fuge. Tatsächlich bedient sich Beethoven hier erstmals einer Fuge als Satzbasis (anstatt andere fugenähnliche Kompositionstechniken anzuwenden), und das Werk ist somit das erste, das von jenen kontrapunktischen Überlegungen geprägt ist, die schließlich die Werke seiner letzten Jahre dominieren sollten. Die Variationsreihe über eine Weise aus Händels Judas Maccabaeus und Mozarts ‘Ein Mädchen oder Weibchen’ geht in jene Zeit zurück, in der er die Sonaten des Op 5 schuf. Mit der Bearbeitung einer Händelschen Melodie war Beethoven wahrscheinlich dem Vorschlag des Barons Gottfried von Swieten gefolgt, einem wichtigen, in Wien lebenden Förderer der Musik Bachs und Händels, der, mit den Worten des Musikhistorikers aus dem achtzehnten Jahrhundert, Johann Ferdinand von Schönfeld, als ‘Patriarch der Musik’ angesehen wurde. ‘Sein Geschmack ist nur nach dem Höchsten und Besten. Besucht er ein Konzert, richten unsere Musikliebhaber ihren Blick unablässig auf ihn bei dem Versuch, seine Gesichtszüge zu deuten, die nicht immer jederman verständlich sind, um dann zu erraten, was sie von der Musik halten sollten. Jedes Jahr gibt er einige wenige große und vorzügliche Konzerte, deren Repertoire nur aus Werken der alten Meister besteht. Seine Vorliebe gilt der Händelschen Art, und er arrangiert des öfteren einige der großen Chorwerkes Händels’. Doch bedurfte es bei Beethoven nur wenig Überredung, denn er richtete seinen inspirativen Blick sowohl auf Händel als auch auf Mozart. Wie Ries niederschrieb: ‘Beethoven schätzte Mozart und Händel in hohem Maße, dann S. Bach. Wann immer ich ihn auch aufsuchte, hatte er Musik in der Hand oder auf dem Schreibtisch zu liegen, die ganz unvermeidlich immer von einem dieser Helden stammte’. Die zwölf Händelschen Variationen, die die Struktur des würdevollen Themas widerspiegeln, vermitteln einen Beethoven in besonders formaler Stimmung. Der entschlossene Stil des Themas (Allegretto) wird ganz bis zur zehnten Variation aufrecht erhalten, die mit einer Bestätigung in Gestalt eines Allegro über die ursprüngliche Melodie zum Ausgangspunkt zurückkehrt. Die letzten beiden Variationen sind ein rhapsodisches Adagio, dessen Thema in höherem Maße verschleiert ist, und ein joviales Allegro-Finale im Dreiachteltakt. In den Variationen über Mozarts Werke des Op 66 drückt Beethoven eine gespanntere Stimmung aus, im besonderen ist nun eine größere Flexibilität der Instrumentierung vorhanden. Das Präsentieren in staccato des Allegrothemas erinnert den Hörer an den ursprünglichen Kontext, in dem Mozart es einst für das Strumento di acciacio (‘Instrument aus Stahl’, wahrscheinlich ein Glockenspiel) instrumentiert hatte. In der ersten Variation bleibt das Cello stumm, spielt in der zweiten jedoch eine vollständige Kontrapunktstimme. In der dritten ist es beinahe unbeweglich, indem es die schnellen Figurationen gänzlich dem Klavier überläßt. Die nächsten sechs Variationen erforschen eine große Vielfalt an Strukturen und Bearbeitungsweisen des Themas. Wie bei den Händelvariationen ist auch hier die zehnte ein Adagio, während die vorletzte ein ausdrucksvoller, mit Poco adagio, quasi Andante markierter Satz ist, der direkt in die im Dreiertakt gehaltene letzte Allegro-Variation übergeht. Die zweite Reihe der Mozartvariationen, WoO46 wurde im großen und ganzen 1801, halbwegs zwischen den Sonaten Op 5 und Op 69, komponiert. Zu Beginn dieses Jahres hatte Schickaneders Inszenierung der Zauberflöte am neuen Theater an der Wien (in dem später auch Beethovens Oper Fidelio uraufgeführt werden sollte) bewirkt, daß die Oper ‘in aller Munde’ war, und es liegt der Gedanke nahe, daß sie Beethoven zu seinen sieben Variationen über das Duett ‘Bei Männern, welche Liebe fühlen’ inspirierten. Die Phrasen der Andantemelodie sind auf beide Instrumente verteilt, eine Technik, die außerdem in den ersten vier Sätzen angewendet wird, in denen das Thementempo bewahrt, die Länge der Noten jedoch vermindert wird. In der munteren fünften Variation erhöht sich das Tempo, verlangsamt sich in der rhapsodischen sechsten jedoch zu einem Adagio. Nach der letzten Variation, Allegro, ma non troppo, folgt eine ausgedehnte Coda, die ein neues Thema in c-Moll vorstellt, und nach der kontinuierlichen Tendenz zum Pianissimo hin, ist das Fortissimo am Ende beinahe eine Überraschung.